While I was overseas earlier this year, a wonderful Brisbane violinist sent me a brief message recommending a novel she thought I’d enjoy and which would be perfect for me to blog about. As it just so happened, I already owned a copy but hadn’t got around to reading it yet (I tend to do that a lot! ), so as soon as I returned from Europe I went hunting on my shelves. 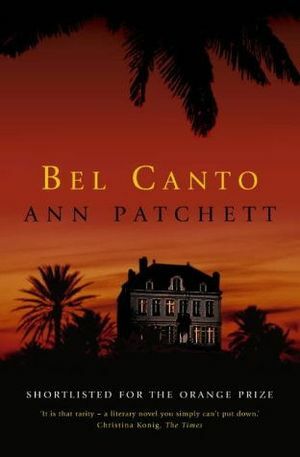 The book was Bel Canto, by American author Ann Patchett, and my friend was right – I loved it. Bel Canto is set in an unidentified South American country, at the extravagant and luxurious home of the Vice President. To celebrate the birthday of honoured visiting Japanese businessman Mr Hosokawa, a private party of international guests gathers and is enjoying a perfect performance by renowned and beloved opera singer Roxane Coss when terrorists storm the building. They intend to kidnap the President and leave. Unfortunately the President is not in attendance, having stayed home to watch his favourite TV soap. And so what begins as a simple kidnapping operation slowly unfolds into a house arrest, as power structures and fractured lives are revealed. As the novel progresses, some hostages are released. Those whom remain form friendships and bonds which are transcended by language differences, most of the guests being international diplomats or foreign investors, and only Mr Hosokawa’s translator Gen is able to aid communication between many of the different groups. There is also a young local priest in attendance, who is offered the opportunity of release but who chooses to stay. Slowly but surely, it is the hostages who begin to have more control over their daily routine of captivity; particularly Ms Coss, whose magical voice transfixes everyone, terrorists included, with its beauty. By negotiations, music is allowed into the house once again, and a perceptible shift in power dynamics begins as Roxane practices and performs daily for the household. It’s an absolutely beautifully-written novel. Tender, intriguing, and full of music. Here’s a passage from about the middle of the book, with a piece I didn’t know until I looked it up. “As Father Arguedas opened the windows in the living room, he thanked God for the light and the sweet quality of the air. Though he was in the house, across the garden, and behind the wall, he could hear more clearly the rustling on the street without the rain to muffle the sounds. There were no more messages shouted over the wall, but still he could imagine a large crowd of men and guns. The priest suspected that either they had no plan of action anymore or that they had a plan so complex that it no longer exactly included them. While General Benjamin continued to cut out every mention of their circumstances from the newspaper, they had caught a snippet of talk on the television that a tunnel was being dug, that the police were planning on digging their way up into the house, and so the crisis would end much the way it had started, with strangers crashing into the room and redirecting the course of their lives, but no one believed this. It was too far-fetched, too much like a spy movie to be real. Father Arguedas stared at his feet, his cheap black lace-up shoes settled on such expensive carpet, and he wondered what went on deep beneath the ground. He prayed for their safe delivery, for the safe delivery of each and every one of them, but he did not pray to be rescued through a tunnel. He did not pray to be rescued at all. He only prayed for God’s will, His love and protection. He tried to clear his heart of selfish thoughts while at the same time being grateful for all that God had granted him. Take the mass, as only one example. In his former life (for that was how he thought of it now) he was only allowed to celebrate the mass with his parishioners when everyone else was on holiday or sick and then it was the six a.m. mass they gave to him or a mass on Tuesday. Mainly his responsibilities within the church were the same as the ones he had held before he was a priest: he distributed the host he had not blessed on the far left-hand aisle of the church or he lit the candles or he snuffed them out. Here, after much discussion, the Generals agreed to allow Messner to bring in the implements of communion, and last Sunday in the dining room, Father Arguedas celebrated the mass with all of his friends. People who were not Catholic attended and people who did not understand what he was saying got down on their knees. Everyone was more likely to pray when there was something specific they wanted. The young terrorists closed their eyes and bent their chins deeply to their chests, while the Generals stayed in the back of the room. It could have been something else entirely. So many of the terrorist organisations nowadays wanted to abolish all religion, especially Catholicism. Had they been taken over by La Dirección Auténtica instead of the much more reasonable La Familia de Martin Suarez, they would never have been allowed to pray. LDA would have dragged one hostage up to the roof every day for the press to see, and then shot him in the head in an attempt to speed negotiations. Father Arguedas considered such things while he lay on the living-room carpet late at night. They were fortunate, really. There was no other way to look at it. Wasn’t there still freedom in the deepest sense if there was the freedom to pray? At his mass, Roxane Coss sang “Ave Maria,” an event of such startling beauty that (and he did not wish to sound competitive) it simply could not be topped at any church, anywhere, including Rome. Her voice was so pure, so light, that it opened up the ceiling and carried their petitions directly to God. It swept over them like the feathery dusting of wings, so that even the Catholics who no longer practiced their faith, and the non-Catholics who came along because there was nothing else to do, and all those who had no idea what he was saying, and the stone-cold atheists who wouldn’t have cared anyway, because of her singing they all went away feeling moved, feeling comforted, feeling, perhaps, the slightest tremors of faith. The priest stared at the slightly yellowed stucco wall that protected them from whatever was waiting to happen outside. It must have been ten feet high and was covered in some sections with ivy. It was a beautiful wall, not unlike what might have surrounded the Mount of Olives. Perhaps it was not immediately obvious but now he saw how one could consider such a wall a blessing. Roxane sang Rossini that morning, in keeping with the weather. One song, “Belta crudele,” she sang seven times. Clearly, she was trying to perfect something, to find something lodged at the very center of the score that she felt she had not reached. She and Kato communicated in their own way. She pointed at a line of notes. He played it. She tapped her fingers in light rhythm against the top of the piano. He played it again. She sang the line unaccompanied. He played it without her. She sang while he played. They circled each other, each one oblivious to feelings, each caring only for the music. She closed her eyes while he moved through the opening, she nodded her head slightly in approval. He made such easy work of the score. There was no showy bravado in the movements of his arms. He kept things small and light, perfect for her voice. It was one thing when he played for himself, but when he was the accompanist he played like a man who was trying not to wake the neighbors. From Bel Canto by Ann Patchett (2001), pp198-201. This entry was posted in Literature, Solo Vocal Music and tagged Ann Patchett, opera, Rossini, South America. Bookmark the permalink.